Governors have a wide range of priorities they want to tackle in the coming year, from tax reform to education. Yet it’s a topic that receives less attention on the campaign trail and in their speeches that could determine their success — natural disasters. In the last two years alone, storms and natural disasters have killed scores of people, damaged or destroyed tens of thousands of homes and cost tens of billions of dollars. Wildfires in the West and hurricanes in the South have been especially destructive, and scientists say climate change is making this more common. As the severity escalates, governors are finding they have to make disaster planning a priority or risk the consequences of inaction defining their terms and enraging voters. Handling disasters and emergencies was a prime topic last week when the National Governors Association held a three-day seminar in Colorado that most of the nation’s 19 governors-elect attended. For many Democratic governors especially, the main concern is how climate change appears to be worsening the effects of natural disasters. In California, half of the 10 most destructive wildfires in state history have occurred since 2017, and the costliest have been in each of the past three years, according to the state firefighting agency. The state has spent $500 million from its emergency firefighting fund just since July 1, putting this wildfire season on pace to be among the costliest yet. The state is dealing with its most destructive wildfire ever, a Northern California blaze that leveled a town of 27,000 this month, killed at least 80 people and left thousands homeless. That blaze, and another that roared through Malibu at the same time and left at least three dead, are the latest in a string of catastrophic wildfires that have put the state in what seems like a perpetual state of emergency. Outgoing Gov. Jerry Brown has called California’s mega fires “the new abnormal” as climate change turns the state warmer and drier. The escalating destruction prompted state lawmakers to pass a series of wildfire-related bills this year. Among other provisions, they provide millions of dollars to cut trees and brush, make it easier for property owners to clear their land and require the state’s utilities to step up their fire-prevention efforts. During his campaign, incoming Gov. 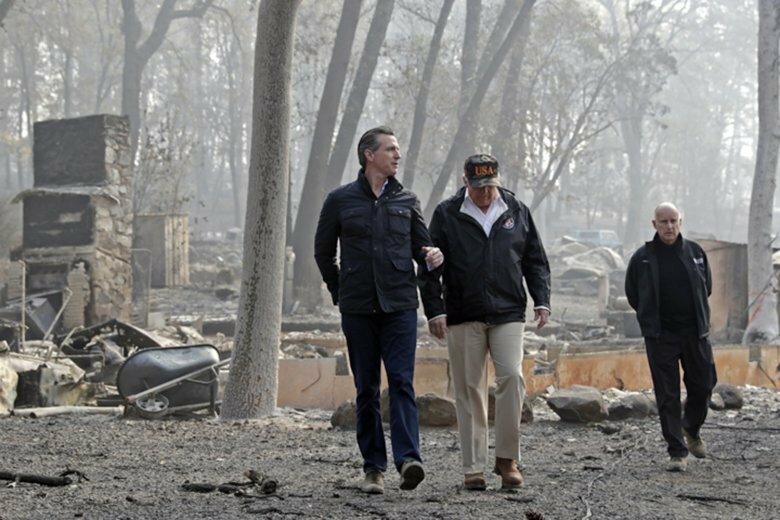 Gavin Newsom said wildfire planning would be a priority for his administration and outlined a number of steps he wants to take. Among them is a more aggressive approach to clearing trees and brush, particularly the state’s millions of dead trees. “I’d rather see our National Guard working on those kinds of emergencies than being on the border,” Newsom told the nonprofit news organization CALmatters over the summer. He also proposed deploying a network of infrared cameras to detect wildfires early, improving the emergency alert system and boosting funding for fire departments throughout the state. A spokesman, Nathan Click, said Newsom is putting together a comprehensive wildfire strategy as he prepares to take office in early January. But the governor-elect also has been clear that the long-term goal must be reducing greenhouse gas emissions. California’s fire season has been especially severe, yet other Western states also have experienced ever-intensifying wildland blazes in recent years. In Colorado, the two most destructive wildfires in state history erupted within the last six years, killed a total of four people and destroyed more than 850 homes combined. Both are believed to be caused by humans, leading Democrat Jared Polis, Colorado’s governor-elect, to call for a public education campaign to reduce the possibility of manmade wildfires. He also said the state should invest in programs to remove flammable debris and help communities and private landowners take steps to prevent the spread of wildfires. Nearly 1 million people in Colorado live in areas considered to have at least some risk of a devastating fire. Florida has been hit with two deadly and destructive hurricanes in roughly a year’s time. Hurricanes Irma last year and Michael in October caused tens of billions of dollars in damage. Even without hurricanes, many coastal communities are dealing with flooding from high tides and storm surges. Incoming Florida Gov. Ron DeSantis, a Republican, has already said he will work with local governments to address rising sea levels, but has been criticized by Democrats for avoiding any mention of climate change in his environmental plan. DeSantis has said he is neither a climate change “denier” nor a “believer.” That could be a problem for identifying long-term solutions to keep coastal communities safe, said Jen Hensley, the director of state lobbying and advocacy at the Sierra Club. She said one reason Hurricane Michael was so devastating was a lack of strong statewide coastal development standards. A massive federal report released Friday warns that disasters such as wildfires and hurricanes are worsening in the United States because of global warming. It’s similar in Texas, which has seen widespread destruction from hurricanes and where Republican Gov. Greg Abbott has been noncommittal about whether he thinks human activity is affecting the climate. Texas has sought $12 billion from the federal government for a 60-mile coastal “spine” of concrete seawalls, floating gates and steel levees as a defense against future hurricanes and higher tides expected from climate change. That’s just a fraction of the work the state estimates need to be done over the next decade to reduce the impact of flooding. In 2017, Hurricane Harvey left Houston underwater, killed dozens and left an estimated $125 billion in damage. Abbott named a recovery czar after the storm and wants to “future-proof” the Texas coast, but attention on the issue has faded. Governors in New York and New Jersey pushed for changes after Superstorm Sandy devastated the region in 2012. In New York, Gov. Andrew Cuomo, a Democrat, signed a law requiring sea level rise projections to be used whenever the state considers approvals or funding for projects. Then-New Jersey Gov. Chris Christie, a Republican, pushed policies to buy homes in some flood-prone areas, although environmentalists criticized him for not addressing climate change. Those groups cheered last year when Democrat Phil Murphy was elected to replace Christie, but they have been critical of him too since, saying he’s not taking action to address global warming. Earlier this month, Murphy experienced the perils of falling short on the basics of emergency preparedness when an early season snowstorm hit without plows at the ready, bringing roads and the transit system to a standstill and stranding thousands of commuters. He was hit with waves of criticism, and his transportation commissioner was forced to apologize. Associated Press writers Dan Elliott in Denver; Tom Verdin in Sacramento, California; David Warren in Dallas; and Paul J. Weber in Austin, Texas, contributed to this article.